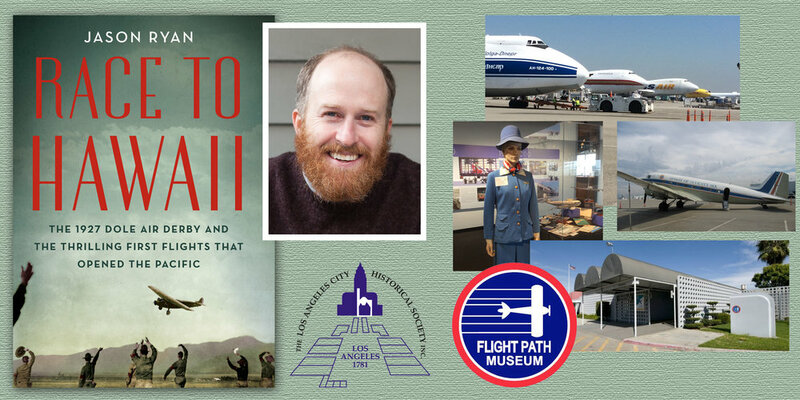 "Race to Hawaii: The 1927 Dole Derby and the Thrilling First Flights that Opened the Pacific"
Nonfiction author Jason Ryan will discuss his new book, Race to Hawaii: The 1927 Dole Derby and the Thrilling First Flights that Opened the Pacific, which details the first attempts to cross the Pacific Ocean by airplane. The same summer Charles Lindbergh made flying the Atlantic look easy, other civilian and military aviators struggled to leap across half of the mighty Pacific, suffering from fuel shortages, plane malfunctions and the formidable navigational challenges involved with finding the pinpoint Hawaiian Islands within a vast ocean. Ryan’s book documents three principal flight events across the Pacific, including journeys attempted by the Army, the Navy and a group of civilian flyers competing in an air derby between Oakland and the island of Oahu. These journeys were not easy, and oftentimes a pilot and a navigator took off for the islands but never arrived. Among the brave men and one woman who flew for Hawaii were a number of Hollywood stunt fliers, and Ryan promises to share tales of their audacious flying antics before the movie cameras and across the ocean. Flight Path Learning Center Museum is offering docent-led tours after the presentation. Free parking at the museum. Capacity is limited - Reservation Required! This is a free event, but please consider giving a donation to the Flight Path Museum when making your reservation. Jason Ryan is the author of the true-life marijuana smuggling tale Jackpot: High Times, High Seas and the Sting that Launched the War on Drugs, as well as the true crime thriller Hell-Bent: One Man’s Crusade to Crush the Hawaiian Mob. A former newspaper reporter and a graduate of Georgetown University, Ryan lives in Charleston, South Carolina, and is an occasional contributor to The Daily Beastand Agence-France-Presse. Flight Path Museum currently features a panoramic mural saluting the 100th anniversary of flight and the 75th anniversary of Los Angeles International Airport and Los Angeles World Airports, the City agency that operates LAX. A spectacular, custom designed mural includes authentic historic photographs from Southern California’s formative years of aviation through the 21st Century. The Main Gallery includes models, photographs, uniforms and other artifacts highlighting the role of airlines, aircraft manufacturers, aerospace companies, and the airport in Southern California's history. Many items are from private collections, never before on public display.